The Heritage Room murals pictured above were created by Inspired Artisans, Ltd., owned by Gianfranco Tassara, in Milwaukee Wisconsin. The painting was done by Katie Musolff, a graduate of the Milwaukee Institute of Art and Design. At Notre Dame of Elm Grove, Wisconsin, one of the campus’ historic buildings, Notre Dame Hall was completed in 1898. In conjunction with SSND’s 175th anniversary, the old chapel – now used as the Heritage Room — received much needed repairs and renovation that included updates to electricity, restoration of stained glass windows and the addition of museum quality display cases. The makeover culminated in 2010 with the installation of murals in four niches of the Heritage Room balcony. 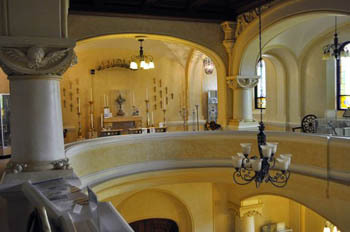 Photograph taken from the balcony shows the crosses for the Perpetual Adoration Chapel. The canopy’s six symbols represent the provinces of North America at the time the chapel was built in 1959.